Tender small shrub with glossy green leaves often tipped with dark purple, especially in sun. 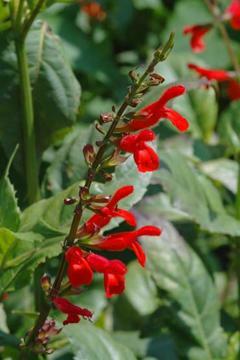 Spikes of vivid scarlet-red flowers from July and lasting well into autumn. Well drained moist, humus-rich soil and part shade or full sun in a warm sheltered position. Needs protection from frost. Does not normally attain full size in cool areas, perhaps reaching about 60cm. From Belize, Guatemala, parts of Mexico.